when you choose to hide a friend's Facebook post. After years of public requests to implement a “Dislike” button on Facebook, the social networking site has finally given in. Sort of. According to a report by ABC News, Facebook will be implementing a new feedback system over the next few months that will not only allow you to hide posts that you dislike, but also tell the site exactly what you don’t like about the content. 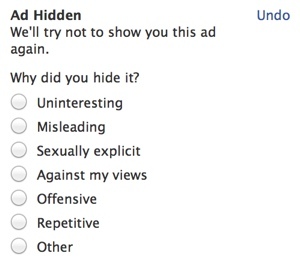 The company has yet to release details, but the interview hints that the system will be very similar to their advertisement feedback option, where you can hide and mark ads as uninteresting, offensive or repetitive. No one will know you’ve hidden a friend’s post but Facebook – the original poster is not notified. Of course, the end game here isn’t to make your feed more relevant. Facebook is gathering this information to sell to advertisers, helping companies better tailor promotions in your news feed to be more relevant and better catch your attention. Advertising is big business at Facebook: The social network earned $1.6 billion in ad revenue in the last 3 months alone. Remember, each time you give Facebook feedback you’re giving the site a little bit more information about you to sell. I recommend taking a moment to review your Facebook privacy settings before you start reporting post, just so you know which actions of yours are public, and which actions of yours Facebook can monetize.